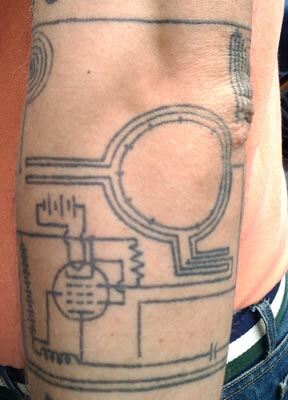 When this tattooed elbow passed me by in the street last Summer I stopped its owner and asked to take a photograph. The very friendly man said I was one of very few people who had identified the image as that of the Hieronymous Device, or wishing machine, and told me that he used his own personal wishing machine regularly. So, what the heck is the Hieronymous Device? Described in 1957 by arch-debunker Martin Gardner as promising to be “even funnier than Dianetics”, engineer Thomas Galen Hieronymous’s Type One Psionics Machine is an archetypical piece of magical technology. A variant of the radionics devices created by Albert Abrams earlier in the century, the Hieronymous machine came to public attention through the enthusiasm of John W Campbell Jr, editor of Astounding Science Fiction. Just to put things in perspective, Campbell also gave L Ron Hubbard’s “Dianetics” its first public platform. The Hieronymous Machine has the unusual distinction of being the only psychically-operated – or psychotronic – device to have received a US Patent. On 27 September 1949 it was awarded patent 2482773 for the “detection of emanations from materials and measurement of the volumes thereof.” Hieronymous claimed that his invention could detect “Eloptic Radiation”, a form of energy emitted by “everything in our material world”, which is then “tuned in” to by a psychically sensitive human operator. According to Hieronymous everything, whether animal, vegetable or mineral, has an eloptic signature and vibrates at its own unique frequency. The component elements of more complex objects, like human beings, interact eloptically to create more complex signatures: in this way people can be identified from drops of sweat or blood. Because eloptic energy is conducted along light rays, photographs also contain eloptic traces of their subjects. The device’s potential applications were almost unlimited: Hieronymous suggested chemical analysis, military photographic intelligence (which he claimed to have done), horticulture and animal husbandry, amongst others. Hieronymous later developed an eloptic transmitter, which he claimed could remotely heal living beings and, in one experiment, transmitted sustenance to plants in a lightless room. 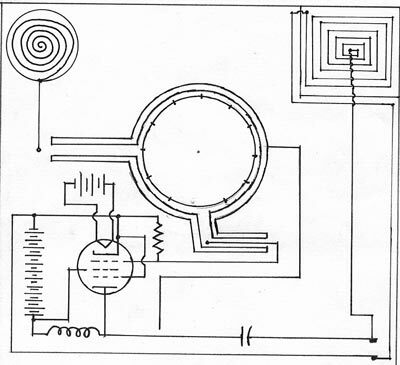 Like other radionics devices, the transmitter also proved useful in pest control: a photograph of a field or garden, and a sample bug, was enough to clear it of parasitic critters. A radio ham and electrical tinkerer, John Campbell built a Hieronymous device expecting it to be a joke but, to his surprise, it worked. In a truly bizarre next step, he discovered that not only did the machine itself – composed of electrodes, condensers, prisms and dials – work, but so did the printed circuit diagram, on its own. Yes you did read that right. Fondly remembered by many Astounding! readers, the Hieronymous machine has, perhaps understandably, been forgotten by science. However, plans are available online should anyone care to print them out and put Campbell’s wilder claims to the test. And here’s a link to a PDF from the good folks at MAKE showing you how to build your own.